Rocky Mountain Snowcats, providing great used snow grooming equipment, headquartered in Calgary, Alberta. 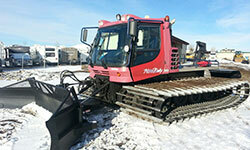 A Division of Pacesetter Equipment Ltd.
Rocky Mountain Snow Cats is Western Canada's source for good used snow cats. 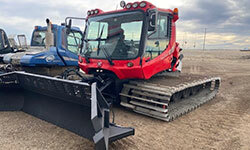 We specialize in used Bombardier and Pisten Bully snow grooming equipment. We fully service and inspect all of our "snow cats" in order to make them ready to go to work! Rocky Mountain Snow Cats combines experience and technology in order to deliver the best product possible to its clients. Our many years of experience in building ice roads, snowmobile trails, as well as roads and trails for movie productions, have helped us gain the knowledge of what is needed in snow-bound areas. We carry a large variety of models to suit your needs. Check out our current stock and contact us for more information on any unit or units in which you are interested. 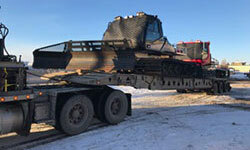 For any heavy equipment needs, we invite you to visit our parent company's website, Pacesetter Equipment Ltd.
Rocky Mountain Snow Cats is headquartered in Calgary, Alberta, from where we are pleased to serve any location within Western Canada. Copyright 2007-2018 Rocky Mountain Snow Cats, a division of Pacesetter Equipment Ltd. All rights reserved.